In November of this year, the Indigo Road restaurant group brought Charleston native Jeremiah Bacon on board as the new executive chef and partner at Oak Steakhouse. After some fine tuning, Bacon has established his own personal touch to the menu, taking it in a progressive, local direction. A native of Charleston manning the kitchen of a beautiful steakhouse with a wholehearted commitment to the farm-to-table program - it doesn't get much better than that. The recent menu changes established by Bacon encompass a wide range of not only Certified Angus Beef behemoths, but locally caught seafood, house-made "Foie" burgers, as well as sides and salads made from gorgeous local vegetables rich in color and flavor. I recently had the chance to sample the menu, and the following are the highlights from my evening at Oak. Deciding on an appetizer is your first hurdle, as all eight options are so enticing as to make you revert back to your schoolyard "eeny meeny miny moe" decision making process. Our server helped narrow our focus down to the Carpaccio of Beef, Dave's Clams-Casino and North Carolina Oyster Rockefeller - Stump Sound. 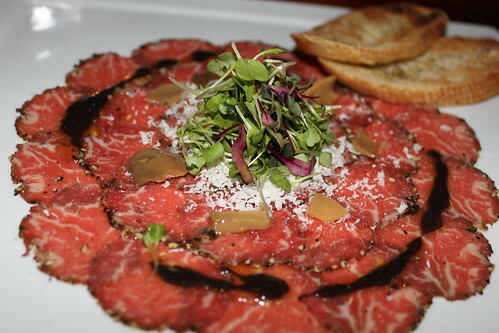 The Carpaccio of Beef is beautifully plated and seasoned with shaved truffles, truffle vinagrette and Parmigiano-Reggiano cheese that it wins hands down as my favorite app. 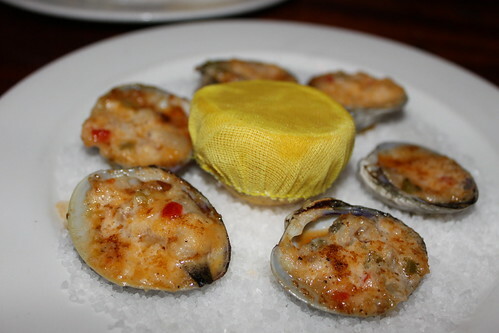 Both the Clams-Casino and Oysters Rockefeller were nicely done, the clams with a subtle hint of red pepper and bacon and the oysters, offered by the shell, cooked in a traditional fashion. In true steakhouse fashion, the side orders are prepared family style. One side of particular note is chef Bacon's Bone Marrow Bread Pudding. This savory side may sound like a leap of faith, but be brave, you'll thank yourself afterward. 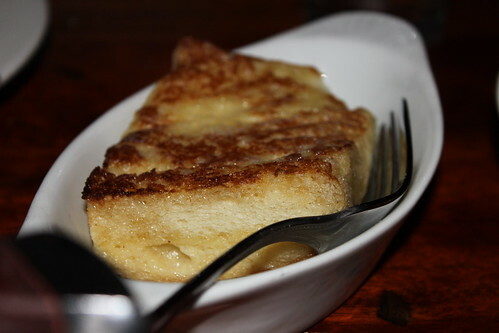 This untraditional version of bread pudding is what I'd like to call something reminiscent of garlic bread french toast. Light and soft, yet crispy and rich, this is something you must treat your taste buds to. Our other side option were the Truffled Pomme Frites. 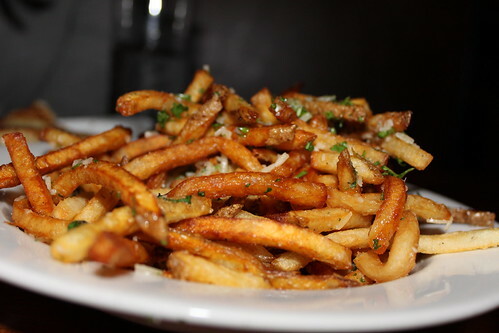 These golden brown, thin cut truffle oiled and sea salted fries are out of this world. Forget about asking for ketchup, aioli or any dipping sauce, you won't be needing it. I opted to try something other than the traditional ribeye, New York Strip or filet and ordered the Braised Beef Shortrib entree served with a Roasted Root Vegetable Mash and Watercress. Slow cooked and marinated perfection, this boneless, thick cut short rib is something special. The meat pulls apart easily, no use for my knife what-so-ever. The accompanying roasted root vegetable mash was a nice alternative to your standard whipped potatoes. To take a look at chef Bacon's full menu, click here. To make a reservation, call (843) 722-4220.